I live in Herne Hill, south London, so it was great to be invited to take part in my local TEDx this summer — TEDxBrixton. Thanks very much to Linnie Rawlinson and Stephanie Busari for asking. My talk on the Geek Manifesto — with a local twist about how randomised controlled trials might be used to inform rubbish collection policy — has just gone onto YouTube. Here it is. I wasn’t the only person to be pretty disappointed in the Independent’s decision to give a platform this weekend to Andrew Wakefield’s ludicrous and self-serving claim that the Swansea measles epidemic is not his fault, but the Government’s. Martin Robbins and Phil Plait have already written excellently about this, so I don’t have to at length. But I thought I’d add a few thoughts on the saga from my own experience as a science journalist. When I worked at The Times, I used to judge myself as much by what I kept out of the paper as by what I got into it. This would have been one I would have been proud to see land on the spike. Andrew Wakefield attempting to justify himself and blame the Government for the outcome of his own scaremongering is not news. The content of a Wakefield press release is about as illuminating as the things people shout at cars. It is ok to ignore him. That is what he is desperate for you not to do. 1. Don’t splash on it. Or put it on the front page for that matter. Prominence matters, and rather suggests that you, the editor, think that the person you’re writing about is making a point that deserves to be heard, even if you disagree with it. The proper place for a story like this is inside the book. 2. Don’t pick the headline he’d have picked. “MMR scare doctor Andrew Wakefield breaks his silence: Measles outbreak in Wales proves I was right” doesn’t cut it. “Outrage over struck-off MMR scare doctor’s latest bizarre and dangerous claim” just might. 3. Don’t wait until paragraph 15 — paragraph 15! — before introducing a critic who can explain why Wakefield is wrong. Yes, the quotes to that effect are there. But most readers won’t get to them, and for those who do, the placement suggests a lack of importance. 4. Don’t run the whole Wakefield press release as if it were a commissioned op-ed. How to give the guy’s scaremongering the imprimatur of a respectable newspaper. 5. Don’t forget that the story is about the chutzpah of the man, not about the substance of his claim. Write the whole thing as a critique. This has to start in the intro, and continue to thread through the piece. Don’t even allow the slightest possibility that the odd paragraph could be quoted out of context. If you do, it will be. The Indy usually covers health and science very well, and wasn’t one of the offenders during the original media debacle over MMR. It’s a shame that it managed to score 0 out of 5 this time. As those of you who follow me on Twitter will know, I was, like most science writers, appalled to learn that the plagiarist and fabricator Jonah Lehrer was paid $20,000 by the Knight Foundation this week to lecture about his plagiarism and fabrications. What a dreadful message for a foundation dedicated to promoting journalism to send to, well, journalists. Others have written eloquently about this, and often with more personal reasons than me to be upset. But I was especially struck by a post by Kathleen Raven, in which she listed her own journalistic mistakes. Her point was to show how every one should be a learning experience, “seared into memory” — not something to be brushed aside as colour to support a career in professional redemption. I made plenty of mistakes in my career as a science journalist at The Times, many more than I’d have liked to. There is one, though, that particularly sticks in my mind, for the incredibly constructive way in which a scientist who was justifiably irritated by it complained. Tony Weidberg, a particle physicist, approached me so constructively that I think it provides a great example of how to engage with the media to achieve better coverage of science. I’m reproducing the passage of The Geek Manifesto in which I describe the story, and what I learned from it, here. Unfortunately, I can’t find the offending article on the web — it doesn’t seem to have been archived, though if anyone can find it I’ll gladly link to it. Adversarial approaches to bad science reporting are important weapons in the geek arsenal. But they shouldn’t always be the first ones we deploy. Start by attacking a journalist in abrasive fashion and he is as likely to become defensive and deaf to criticism as he is to take it on board and change his approach. Plenty of science reporters are broadly sympathetic to the aims of [Ben] Goldacre and his allies, but nonetheless brush off their views because they consider them relentlessly negative. Complain constructively, couching criticism as helpful advice, and a surprising number of hacks will listen. Media professionals are as prone as anybody else to ‘cognitive dissonance’. This term from psychology describes the difficulty of holding two pieces of mutually incompatible information in your mind at the same time, and it is easily activated by our own errors. Most journalists like to think they are covering their beat responsibly, thoroughly and accurately. If they are then confronted with a serious error, that information can be difficult to take on board – especially if it’s implied that they have made the error because they are slipshod, conniving, venal or stupid. And dissonance is often more easily resolved by rejecting inconvenient facts than by acknowledging them. Well well. This was not news I was expecting. Via Beck Smith of the Campaign for Science and Engineering, I’ve just learned that David Tredinnick has been chosen by his fellow Conservative MPs to fill a vacant place on the Commons Science and Technology Committee (see point 69 in the link). Tredinnick is one of the stars of the Geek Manifesto — and not in a good way. I’ve thus posted the section about him here. What is sad about this is not so much Tredinnick’s views — there are always likely to be eccentric MPs like this. It is that he has been elected by his Tory colleagues to represent them on the main parliamentary scrutiny committee for science. I’m sure few of his MPs agree with him on astrology and alternative medicine. Yet they’ve betrayed a worrying indifference to science in supporting his candidacy. It’s this indifference to science, not Tredinnick’s (rare) hostility to science, that is the chief cause of disconnects between science and public policy. The Geek Manifesto has plenty of ideas about how we might attempt to change it. On the evening of 14 October 2009, David Tredinnick got to his feet in the House of Commons to open a debate. The Conservative MP for Bosworth, in Leicestershire, was desperately worried that the Health Minister, Gillian Merron, had overlooked a grave threat to the wellbeing of the public. The object of his concern wasn’t pandemic flu, or air pollution, or childhood obesity. It was the moon. ‘At certain phases of the moon there are more accidents,’ he gravely informed the House. ‘Surgeons will not operate because blood clotting is not effective, and the police have to put more people on the streets.’ It wasn’t the first time he had raised the subject in Parliament. Back in 2001, Tredinnick told the Commons that ‘science has worked out that pregnancy, hangovers and visits to one’s GP may be affected by the awesome power of the moon,’ and quoted a newspaper report suggesting that arson attacks double when the moon is full. He stopped short of mentioning werewolves, but you probably don’t need to be told that their existence is about as well supported by science as his other claims. A new set of literary awards launches next week, the Political Book Awards, sponsored by Total Politics magazine and the bookmaker Paddy Power. And I’m very excited to say that The Geek Manifesto has been shortlisted! I’m in the running for the Polemic of the Year prize, against a fine shortlist. I’m honoured to make the same list as such thought-provoking figures as Andrew Adonis, Nick Cohen, Daniel Hannan and David Nutt. The awards are next Wednesday evening, February 6. Many thanks to the judges for shortlisting me! 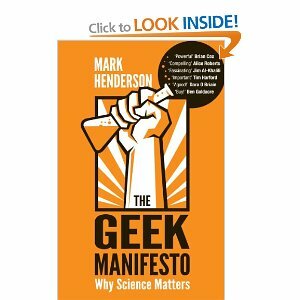 When we published The Geek Manifesto in the United States last year, the fabulous science writer David Dobbs agreed to provide a short foreword that would explain why its message mattered to an American audience. It’s already available with the US eBook, and it’ll be in the paperback. It turned out to be so good that we decided to include it in the UK paperback edition too — this time as an afterword, a DVD extra, if you like. That’s out tomorrow, and David and I have agreed to post it on our blogs as well. Nothing illuminates like a close analogue. So I found during a recent year in London, as I watched scientists and science-writing colleagues there, including Mark Henderson, the author of this book, wrestle with translated forms of the threats that haunt those of us in America who would like to see our country run according to honest airing of fact and principle rather than lies and fear. In the US, we deal with virulent creationism, medicine-by-advertising, and deeply institutionalized resistance to the reality of climate change; in the UK, the assault on empirical thinking ranges from ridiculous prescriptions for colonic irrigation to the sublimely sad savaging of researchers by those who would have us ignore drought, fire and the melting of the ice caps. In noisy pubs and cafés, on the slightly less noisy sidewalks outside pubs and cafés, and in quieter halls of inquiry such as universities and the Royal Society, Henderson, colleagues and I talked and ranted and laughed about these things and, comparing notes, saw how alike the battles raged in Old England and New America. The paperback edition of The Geek Manifesto is out on Thursday, January 3, and all the usual outlets are already taking orders. You can find it on Amazon here, and if you’re avoiding Amazon for tax reasons, you can get it from Waterstones too. I’m delighted to report, too, that the paperback comes with an afterword by the fabulous American science writer, David Dobbs. It’s a piece he wrote as a foreword to the US edition — also now available — which was so good and apposite that my publisher decided to add it to the UK paperback as well. David and I will both be posting his piece on our blogs very shortly.